Boxing and martial arts mouthguards need to provide an extra degree of protection to both dental arches. Although there are currently no evidence-based prospective studies to conclude that properly-fitted mouthguards protect against TMJ injuries, cerebral concussions and cervical injuries many clinicians believe there is a correlation. Boxing mouthguards are required to participate in many venues including the Golden Gloves. Smart athletes make a point to have spares in case of loss or damage. Some believe that the posterior vertical dimension should be increased beyond rest to yield a larger mandibular condylar separation from the glenoid fossa (Hildebrandt JR, Garner-Nelson J: Mouthguard protection for boxing, US Olympic Committee, 1990). These mouthguards need to be made of a firmer material to resist bite-through and change in "power bite" position that heavy clenching might produce. "Power bite" refers to a kinesiologic performance enhanced appliance. (above) 12 Apr 1997 - Oscar De La Hoya hits Pernell Whitaker (left) with a right jab during their Welterweight title bout at the Thomas & Mack Center in Las Vegas, Nevada. De La Hoya won the bout by way of decision after 12 rounds. Dentist's prescribe and order an Occlusal Guard now! Boxing and martial arts mouthguards need to be engineered with provisos for maximum oxygen exchange. Maintaining an adequate airway in the event of nasal obstruction from a blow (see below) is an important consideration (ibid). One way to accomplish this is by eliminating the flange on the lower portion of the bimaxillary mouthguard, which uncovers the mandibular incisors and creates space for breathing. Presently, EVA (ethylene vinyl acetate) copolymer has become the material of choice. However, barring allergy, its elasticity, resistance to deformation during clenching, and historic use since the beginning of the 20th century give natural rubber a certain appeal to some professional boxers. 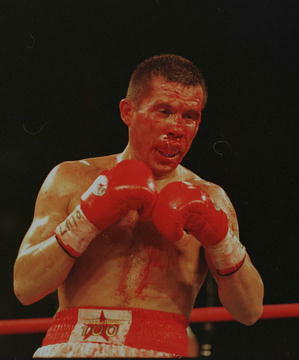 (Above) 7 Jun 1996: Julio Cesar Chavez bleeds excessively after receiving a cut under his left eye during his WBC Super Lightweight title bout versus Oscar De La Hoya at Caesars Palace in Las Vegas, Nevada. 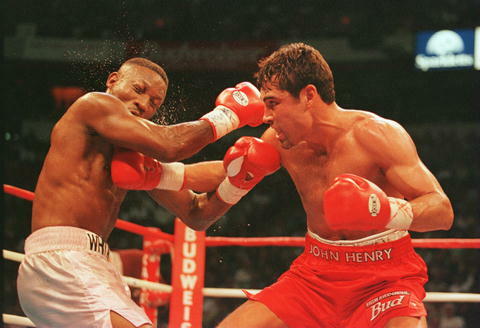 De La Hoya won the bout with a doctor's ruling at the end of the 4th round.